June 16, 2005 - Rockabilly Hall of Fame inductee Ed Bentley, from Yorkshire, NY, looks rather laid back and relaxed on the disc's cover, but when you slap the CD in your player you'll hear nothing that's laid back and relaxed. The story goes like this ... Ed Bently was browsing the Internet, found his name among those listed on the Rockabilly Hall of Fame web site and inquired by e-mail if this could possibly be him. Shortly thereafter, he was informed that "yes" this is you - could you please send a bio and some photos - and Ed was soon inducted. Now, this recently inducted member of the Rockabilly of Fame has released a brand new CD ... "Here We Go Again ... to celebrate his recent induction. This CD, a collection of some original tunes and some older rockabilly and boogie remakes, was recorded at Sessions Recording Studio in Buffalo, NY and is now released on the Rockabilly Hall of Fame label. Says Bob Timmers, founder of the Rockabilly Hall of Fame, "After we found him to be the 'real deal' he was brought into the fold. These veterans of rockabilly music need to have their stories told. That is our purpose and it has great rewards, especially when cats like Ed are still giggin' and recordin'". In 1956 the music of Elvis Presley, Carl Perkins and Johnny Cash was humming over the airwaves and into the homes & hot rods of teenagers across the nation. Many adults figured the sounds were just a passing fad. The kids, including 14-year-old Ed Bentley, knew better. For Ed, Johnny Cash's "I Walk the Line" was a life-changing experience. He loved the music of Cash, Carl Perkins & Jerry Lee Lewis so much he would shamelessly beg his sister for money to buy their records. He also began to realize he was destined to become a musician. Edward Bentley was born February 5,1942 to Edward and Esther "Pat" (Graham) Bentley. They lived on a farm in Belmont, a rural community in western New York state. His mother - who was later re-married to a man named Loveless - was a well know performer in her own right. Ed smiles when he says his mom "is the original Patty Loveless." The teenage Ed enlisted her to teach him to play guitar. He took to the instrument like a duck takes to water. 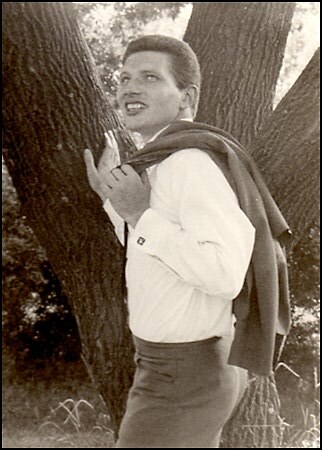 In 1957, Ed won $5 and a brand new, white cowboy hat by performing Marty Robbins' "White Sport Coat and a Pink Carnation," in an ameteur contest at a Buffalo, NY nightclub. Before long, he was performing with such artists as Joanie Marshall, Ernie Weber, and Happy Mann & the Country Squires. He eventually formed the Memphis Sound Band, becoming known as "Eddie" Bentley. Ed also started playing with the house bands at two Buffalo nightclubs - Club Utica and the T & T Western Paradise. He backed such artists as Mac Wiseman, Bobby Helms and Mel Street. But, while he logged plenty of playing time, Ed realized he wasn't making any headway in recordings. So, he packed up his guitar in 1961 and moved to Memphis, Tennessee. He joined Eddie Bond & the Stompers soon after his arrival. His bandmates included the now-legendary John Hughey on steel guitar, and Jimmy Smith on piano. Bond also owned a club called the Little Black Book where Carl Perkins, Charlie Rich and Harold Dorman - who wrote "Mountain of Love" - were booked. Ed earned a whopping $15 weekly, playing there six nights per week. In the wee hours of the morning he'd return to his $8-per-week room at a boarding house he shared with several other young musicians, and a fair amount of cockroaches. "Those were great days in Memphis. We played because we loved the music, we obviously didn't do it for the money," Ed laughs. Ed returned to Buffalo's music scene a year later. In 1964 he recorded the regional hit "Lovin' Man" on the Canadian ARC label. Shorly afterward, he recorded an instrumental piece called "Brang" with Ted Russell, a.k.a. Wade Curtis & the Rhythm Rockers - also listed in the Rockabilly Hall of Fame. From 1965 to about 1967, well-known East coast radio personality Tommy Shannon managed Ed's career. Ed was recording under the name of "Jimmy Satan" - and while the name lent a certain aura of danger to his persona, it didn't help to sell many records. Several of Ed's recordings from that era were released on a Detroit-based Motown subsidiary, including "Look at the Clock Up There," "Richard Cory," and "Dream, Woman, Dream." Ed also played with bands, including Kathy Lynn & the Playboys, with whom he would play again in later years. The year 1967 brought "Drift on You Bum" on the Buffalo - based GJM label, and "The Fool" was recorded 1968. Among the great Buffalo studio musicians appearing on Ed's records during that time were Tommy Calandra, Gary Mallaber - who went on to play with the Steve Miller Band - and Stan (Szelest) and the Ravens, who later worked with Lonnie Mack, Ronnie Hawkins and the Band. Ed flew to Nashville in 1969 to record "Little Children Run and Play" for Paula Records, a label out of Shreveport, LA. After 1969, Bentley elected to shelve the recording career for a while, opting instead to pursue another area of the music business. In 1971 he opened the Ed Bentley Music Center in Buffalo, where he sold musical instruments - catering to his fellow musicians. He was also still going strong with his music, playing honky tonks and shows with the likes of Merle Haggard, Rose Maddox and Buffalo's legendary Stone Country Band. From 1980 to 1982 he was a district sales manager for Gibson Guitar Co., traveling between Detroit, Michigan and Cleveland, Ohio. He decided in 1985 to return to his rural roots, and settled in the small community of Delevan, NY - about 40 miles southeast of Buffalo. Ed has since worked as a salesman, stockbroker, and eventually, an insurance agent - a position that has allowd him to become an independent agent and ultimately own his own firm. Although he put down his guitar, for the most part, over those years, Ed still had the occasion to play with local bands for events around the area. He was contacted in 2004 by former bandmates from Kathy Lynn and the Playboys - now known as Solid Grease - and immediately signed on. Solid Grease now performs hit music of the 50's, 60's and 70's at different venues throughout Western New York. They've received rave reviews and enthusiastic endorsement. 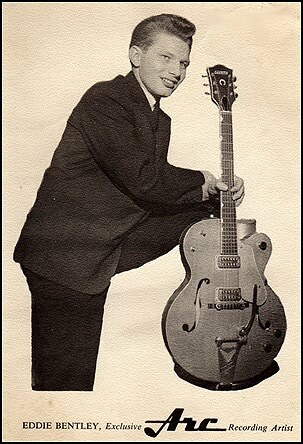 In 2005 Ed was inducted into the Rockabilly Hall of Fame. "After we found him to be the 'real deal,' he was brought into the fold," said founder Bob Timmers. "These veterans should receive their much deserved recognition. That's our purpose and it has great rewards, especially when cats like Ed are still giggin' and recording." With his creative jucies still flowin', Ed just put the finishing touches on his new CD "Here We Go Again," available through this website. He's seen his love of music transcend the generations, and noted that his three children and four grandchildren all have an affinity for playing music. He sitll finds time to jam with his bandmates, and commune with people who love the music of an unfrogettable era. Like his hero, Johnny Cash, Ed Bentley sitll "walks the line." Newspaper article from Arcade Hearald, Thursday, November 18, 2004. On Saturday, November 20, the Town of Yorkshire was hoppin' to the rock 'n' roll sounds of "Solid Grease." The band is made up of Ray Baker of Blasdell (saxophone, vocals), Nick and Kathy Ameno of Wheatfield (guitar, vocals and sax, keyboard and vocals), their son, Terry Ameno of Wheatfield (drums) and Ed Bentley (bass). Bentley is a local resident, who lives in Delevan and works in Yorkshire. Many years ago, when the band first started playing venues, they were known as "Kathy and the Playboys." "We were part of Motown," says Bentley, "and toured all over the United States and Canada." The popular band was backing up such well-known rock 'n' roll pioneers as Fabian, Dion and the Belmonts, Frankie Avalon and many more. "We were real," says Bentley, adding that Tommy Shannon, now a disc jockey with Oldies WHTT, had been the band's manager. Bentley left the band for a while and has since focused on his career in insurance: however, his former bandmates recently called him back to join them in their newly-named hand, "Solid Grease." "I've been in 'storage' for about 15 years," he says. "But they got me out of the mothballs." Collectively, the members of Solid Grease have over 100 years of musical experience and perform hits from the 50's, 60's and 70's.